For a liquid whole food Metabolism Booster with plant-sourced caffeine, click here. Please consider Life Force TruBoost all natural Honest Energy Drink here! Energy drinks are a big deal in today’s world, and chances are if you don’t drink them, you know someone who does. When weighing in the news reports and television doctors’ opinions, more and more people are searching for healthy, natural, and safe alternative to canned energy drinks. And, if it can be less expensive and save on recycling, it would be gold. Yes, actually, it would be gold–Kaos Gold, to be exact. From Life Force International comes a product that provides the same hours of energy to supply the boost you need in your day, but without the concerns or crash popular with convenience store tall cans that are full of caffeine, sugar, and artificial colors and flavors. Simply mix one convenient packet into a bottle of water and drink and you are ready to face the world and your day. 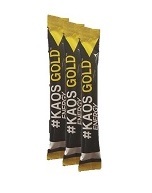 Kaos Gold is your safe, healthier energy drink alternative. Buy it today for yourself, or buy it through the business system to start earning money off energy drinks through a reputable, trustworthy company. NOTE: Not recommended for children, pregnant or nursing women, or those sensitive to caffeine. Fructose, Citric Acid, KAOS-9 Blend (Taurine, Citicoline, Caffeine, Phosphatidylserine, Vitamin B Blend (Niacin, Pantothenic Acid, Pyridoxine HCl, Cyanocobalamin), Guarana, American Ginseng, Yerba Mate, Kola Nut), Sodium Bicarbonate, Natural Flavors, Gum Acacia, Silicon Dioxide, Purified Stevia Extract (leaf), Beta-Carotene (for color). Total caffeine from all sources is 120 mg per serving. How many servings are in a packet of Kaos Gold? One packet of Kaos Gold is one serving. Mix one stick packet (11.355 g) into 8-12 fluid ounces of water. The product contains fizz, so if you are putting it straight into a water bottle, take a few sips of water to make room for it. So you’re saying this is carbonated? No, not at all. The fizz comes from non-calcium draining sodium bicarbonate (baking soda). The phosphates in soda pop are what leach calcium away from bones and teeth, and this product is nothing like that. In fact, the sodium bicarb works as an alkalizer in the body. It has a tropical taste somewhat like mango or pineapple. While not sugary sweet, it is a sweet tasting drink because of the stevia. Do you have a question about the Kaos Gold? Contact us here. So I get asked a lot about energy drinks, especially the popular ones sold in a can at convenience stores and elsewhere. Especially people who know me personally know my beliefs about alternative ways to get energy nutritionally and in practice, such as eating more quality, complete proteins; getting plenty of sleep; drinking enough water for your activity level and salt consumption; exercising moderately every day; and limiting sugars. And for better mental clarity and the energy that comes from that awareness, I always recommend TruBoost Herbal Stress Reducer. However, there is a certain segment of the population–especially those under 29 and into certain fitness regimens–who love their canned caffeine energy drinks. And those people are falling victim to high caffeine and sugar amounts in these drinks causing panic attacks, heart rate problems (arrhythmia), digestive disorders, exacerbation of IBS or Crohn’s, and emotionally creating stimulant addiction and irritability. They are going to drink them; I cannot stop them. But if we can get anyone off these drinks and onto an energy drink that works just as good as those other energy drinks but has less caffeine than a 12-ounce brewed cup of coffee, no sugar, no artificial colors, nutrition from Guarana, American Ginseng, Yerba Mate and Kola Nut, all while paying less money per serving and not filling up landfills with cans, I support that. And with the unique social network marketing opportunity, they can get their friends off those “other guys” as well. * Statements appearing on this website have not been evaluated by the FDA. The programs and products described herein are not intended to diagnose, treat, cure, or prevent any disease. Always consult your physician or health care professional before starting this or any other health and wellness program. If you are under the age of 18, pregnant, lactating, are allergic, or have any other medical condition, please consult a physician before use. Discontinue use if any allergic reaction occurs. Keep products out of the reach of children.